The first episode of Kimura Takuya's drama, "Nankyoku Tairiku", which aired on October 16th, pulled in an average rating of 22.2%! The 2-hour and 5-minute drama reached its peak rating of 25.5% at 10:37 pm. Kimura plays the role of geologist 'Kuramochi Takeshi', who risks his life in an Antarctic expedition with his team and Sakhalin huskies. Meanwhile, Ayase Haruka plays Kuramochi's sister-in-law�'Takaoka Miyuki'. This is the first time in two years since Kimura and Ayase have teamed up in a drama. In the first episode, observation plans for the Antarctic expedition has officially started; however, in Japan, there are no icebreakers to break the Antarctic ice. At such times, a plan to build a 'Souya (icebreaker)' called "Souya no Fune" is proposed. Although the building of the ship starts with the help of the designer of 'Battleship Yamato', there is only 10 months before their Anta+rctic departure. 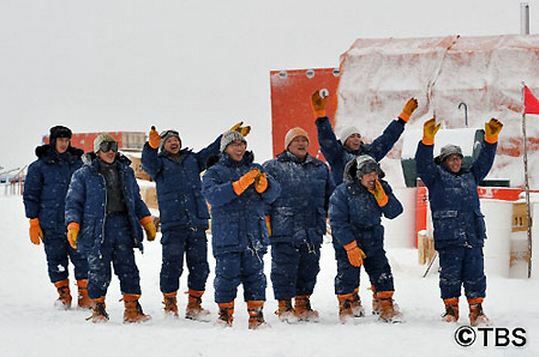 While all this is happening, the members of the Antarctic expedition team are selected, and Kuramochi, who has been training Sakhalian huskies, is faced with an unforeseen event.